You’re invited to our annual open house! You can see the MOnSter 6502 in action, check out an AxiDraw demonstration, maybe meet Zener the cat (she’s not fond of parties), do some shopping if the mood strikes, and share in food and conversation. This entry was posted in Evil Mad Scientist Shop, Field Trips, General News. Bookmark the Permalink. We’re excited to be holding the Silicon Valley Hardware Meetup at our shop in Sunnyvale on Wednesday, December 6 from 6:30-9:30 pm. 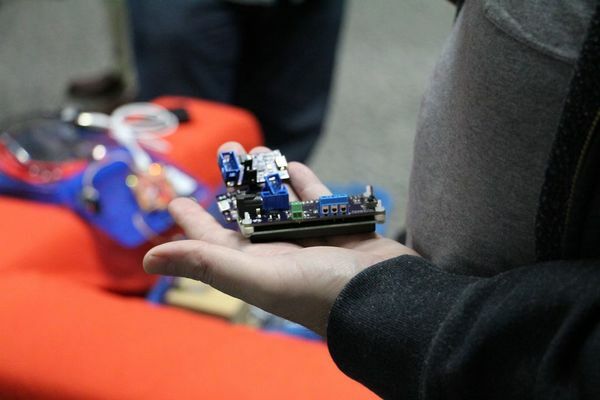 The event is hosted by Supplyframe and Tindie and will have food, drink, speakers and demo time. For full details and to RSVP, head to the event page. This entry was posted in Engineering, Everything Else, Evil Mad Scientist Shop. Bookmark the Permalink. Gravitrack is a fantastic new build-it-yourself desktop-scale marble machine kit from our friends at SolarBotics, and available now at our store. Gravitrack is available in two versions: A no-soldering battery-powered version (shown above), or a soldering-required solar version. We also still carry the original SolarBotics Marble Machines, in battery and solar flavors. This entry was posted in Evil Mad Scientist Shop. Bookmark the Permalink. You’re invited to our open house and shopwarming! Our annual open house is also a shopwarming party this year! You can tour our new location, see the MOnSter 6502 in action, check out an AxiDraw demonstration, maybe meet Zener the cat (she’s not fond of parties), do some shopping if the mood strikes, and share in food and conversation. We’re also having a sale, so you can celebrate with us whether or not you can make it to the event! During our sale this week (October 2-7), use checkout coupon code CELEBRATE to save 10% sitewide at our store. With Halloween approaching, it’s a great time to stock up on Snap-O-Lantern kits, Larson Scanner kits for your Cylon (or Kraftwerk) costume, and Flickery Flame kits to put in your Jack-O-Lanterns. Or maybe you just need some candle flicker LEDs for that finishing touch on your costumes and props. AxiDraw V3, our beloved pen plotter is also currently shipping from stock and 10% off (with that coupon code) during the sale. This entry was posted in Evil Mad Scientist Shop, General News. Bookmark the Permalink. 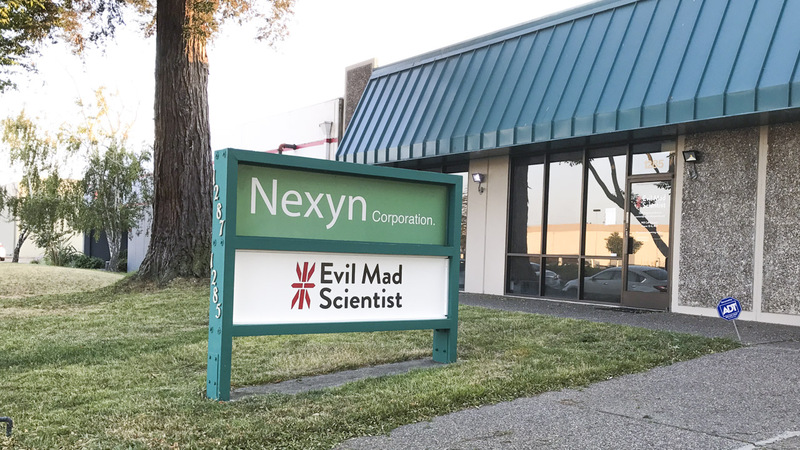 We’re in the process of moving into a nicer, bigger space, still in Sunnyvale, California. Our new shop location is 1285 Forgewood Avenue, and we’ll be closed on Monday, August 21 as part of the move. We will be inviting you to our shopwarming party, which will be on October 7th, 4 pm – 8 pm, so please save the date! Updated 9/30/17 to add time. We are pleased to introduce the AxiDraw V3, a new generation of our flagship writing and drawing machine. 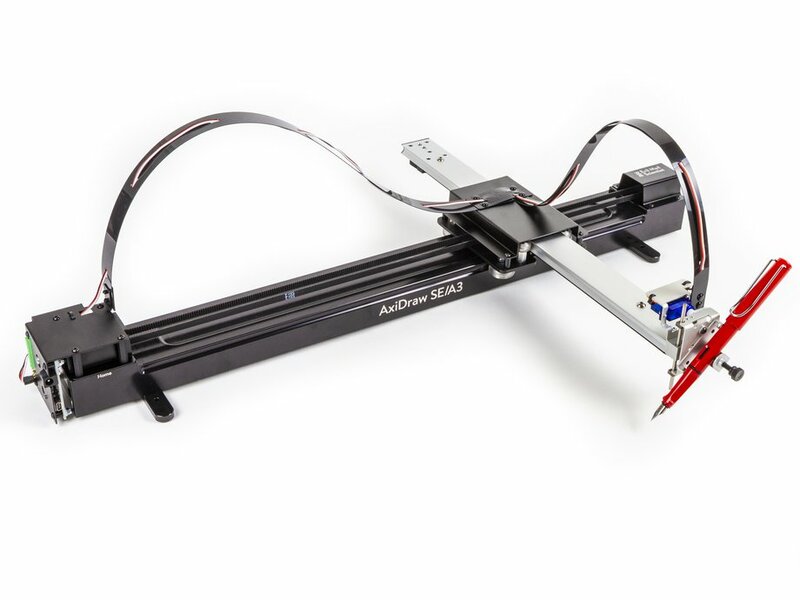 This new AxiDraw has been redesigned from the ground up for high performance. It features smooth rolling wheels on custom aluminum extrusions, specially designed for high stiffness and light weight. Its sturdy, rigid construction gives it finer quality output and in most applications allows it to operate at up to twice the speed of the previous AxiDraw, which it replaces. As with the previous version, AxiDraw is a simple, modern, precise, and versatile pen plotter, capable of writing or drawing on almost any flat surface. It can write with fountain pens, permanent markers, and other writing implements to handle an endless variety of applications. Its unique design features a writing head that extends beyond the body of the machine, making it possible to draw on objects bigger than the machine itself. AxiDraw V3 is available to order today, and begins shipping next week. See it in action and learn more on the product page. 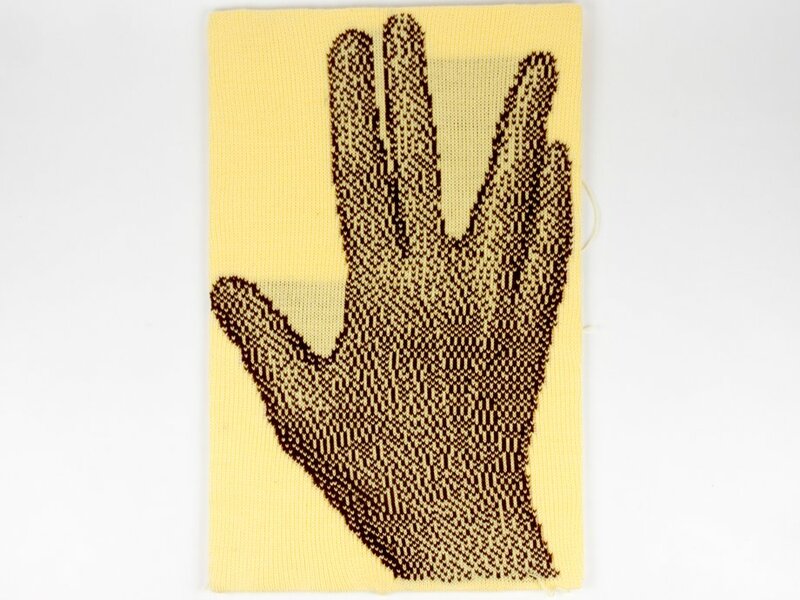 This entry was posted in CNC, EMSL Projects, Evil Mad Scientist Shop, Robotics and tagged AxiDraw, plotter. Bookmark the Permalink. 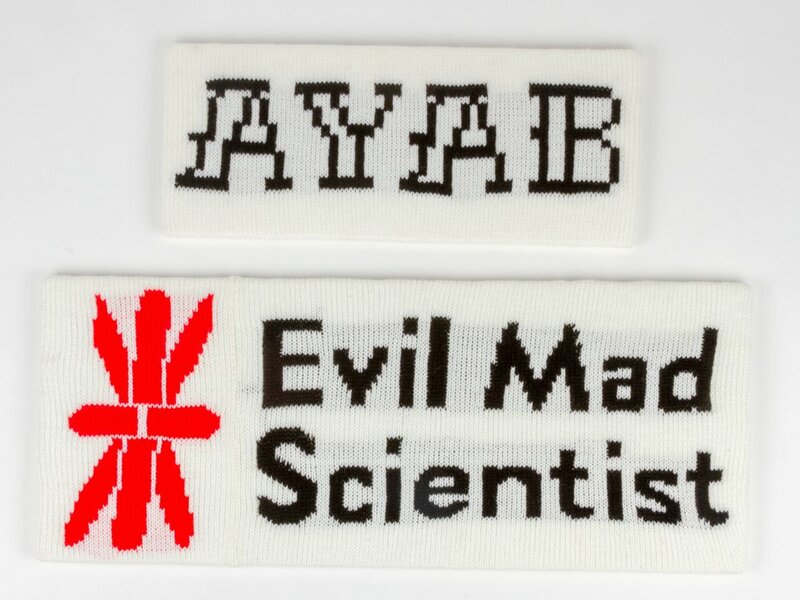 AYAB — All Yarns Are Beautiful — is an open source hardware and software project that provides an alternative way to control the widely-loved Brother KH-9xx range of knitting machines using a computer. There are other hacks (such as Img2Track, Knitic and electro-knit) which work with certain machines in certain conditions. The AYAB interface works with all Brother KH-9xx machines except the KH-970. We’ve just launched a new interface board for the AYAB project. They’ve written about it on their site, and you can read the product details on our store page for it. Historically, these machines were programmed with semi-transparent picture cards which were scanned by the machine line by line. For later machines, you could enter a pattern via lots of tedious button-pressing. Some models had an add-on gadget that connected to your vintage TV. With the AYAB interface, you can provide an image of up to a 200 pixel (or needle) size from your computer. 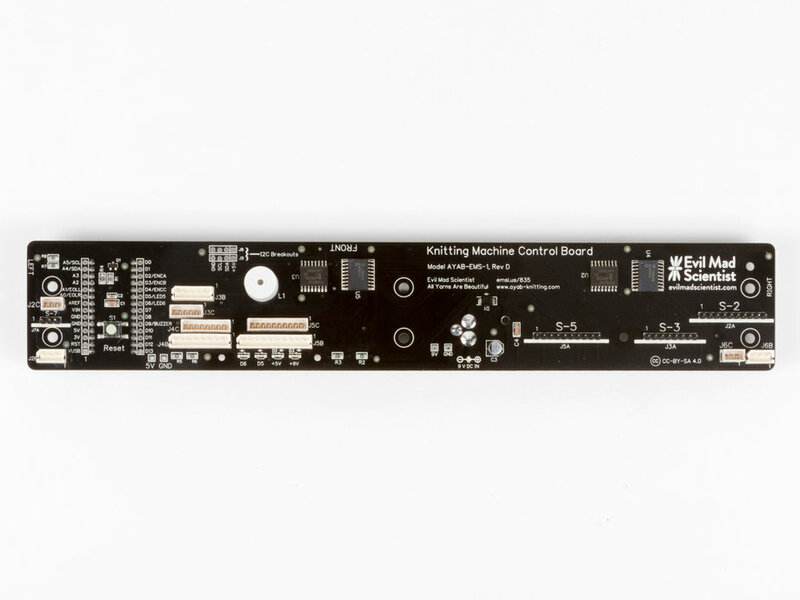 The control is done by an Arduino-compatible microcontroller board, which replaces the vintage control board. We are excited to be helping to bring new capabilities to these beloved machines. This entry was posted in Art, Electronics, EMSL Projects, Evil Mad Scientist Shop, Microcontrollers, Open Hardware, Vintage Technology. Bookmark the Permalink. We are very pleased to introduce our newest art robot: the AxiDraw. The AxiDraw is a fantastic machine for making art — along with all those other things that you might use a pen-wielding robot for: Making “hand written” invitations, signing forms, or making neater whiteboard art than one might otherwise be able to. AxiDraw is available to order today, and begins shipping next week. See it in action and learn more on the product page. This entry was posted in CNC, EMSL Projects, Engineering, Evil Mad Scientist Shop, Robotics and tagged AxiDraw. Bookmark the Permalink. The Evil Mad Scientist Thanksgiving Sale is running now through Monday. Coupon code TURKEY will get you 10% off sitewide, and we have a list of kits on additional discount on our specials page. Thanks for being our awesome readers and customers!